If reports coming out of Russia are true, Vladimir Putin is considering appointing Washington’s agent, Alexei Kudrin, to negotiate Russia’s surrender to Washington. See this and this. In checking out this story with well-informed and connected experts, I am advised that John Helmer in his report might have put too much credence in the story planted on the Financial Times by Kudrin. One expert whose judgment I trust told me that Kudrin and other members of the “pro-US lobby”—the traitors that The Saker calls the Atlanticist Integrationists—are playing their usual games. Kudrin may have gone too far this time by planting the story in the UK’s Financial times of his forthcoming appointment as negotiator of Russia’s surrender to Washington. The expert, whom I trust, told me that everyone in the Putin administration really dislikes Kudrin as a person and political figure — the sly games he plays, exploiting Putin’s personal loyalty from the past. It is widely said in Russia that Putin is too loyal to old friends like Kudrin who no longer serve him well. Kudrin’s few allies are in Medvedev’s group, and Washington’s incompetence recently sanctioned a couple of Kudrin’s Russian allies. Another expert whom I trust responds that rumors fly in Russia like they do everywhere as ambitious people jocky to elevate themselves in the media. In contrast to the rumors that Putin is going to turn Russia’s fate over to an American agent, he reports rumors that Putin, pushed by nationalist patriotism and the military, is about to purge the Russian Fifth Column—Kudrin and the pro-Washington faction. On the other hand, a Russian journalist tells me that in actual fact Putin himself is the biggest pro-Western liberal of them all and that Kudrin was instrumental in bringing Putin from St. Petersburg and installing him in the Moscow establishment. Perhaps Putin’s inaugural address will indicate whether Kudrin will be given the power to surrender Russia or whether the pro-American Fifth Column will be finally excluded from the government or whether nothing changes. Kudrin sounds like a traitor who should be put on trial for treason. It seems unlikely that Putin would make Kudrin the number two man in the Russian government. Kudrin, a protector of oligarchic control of Russia by billionaires who stole their fortunes by “privatizing” public assets, is also known for his advocacy of austerity for the Russian population while creating more billionaires by privatizing state assets. 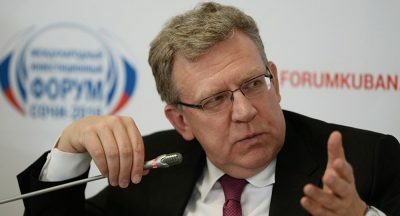 Possibly there is as much fake news in Russia as there is in the US and Europe and that the truth is that Kudrin is a nonentity and not a player in Russian government decisions. However, if Kudrin is elevated, perhaps his rise is due to neoliberal economics. Kudrin along with the Russian central bank and most Russian economists who have been brainwashed by American neoliberal economics—“junk economics” in Michael Hudson’s accurate characterization—believe that the success of Russia’s economy depends on being tied to Washington’s imperial system. They believe—very erroneously and quite stupidly—that without American investment and the lifting of the sanctions, the Russian economy is doomed. That is what they say. The case could be that, like global economic interests everywhere, the oligarchs are only concerned with money, not with their country’s sovereignty. As Michael Hudson and I have pointed out, the neoliberal economics taught to Russians by Americans in effect makes Russian economists agents of the West. The Russian economists represent policies that work to Washington’s, not to Russia’s, interest. Pepe Escobar, who believes Putin is moving in the opposite direction from Kudrin, acknowledges the pro-Washington faction’s control over Russian economic and financial policy. See this. As there are few economists to tell Putin any different, the Russian government receives advice that Russia will fail unless its economy is integrated with the West. Kudrin also intends to cut Russia’s military capability in order to save money with which to pay interest on foreign loans that oligarchs will use to privatize public assets. The consequence would be to make Russia’s vassalage permanent as a colony of the West. In my article on May 3, I asked if Russia knows what’s up. Apparently not in the Middle East. The Russian government thinks Syria is about fighting terrorism and working out a peaceful settlement. But this is the last thing that Washington and Israel want. Washington and Israel want Assad and Iran overthrown so that Hezbollah is left without support and Israel can occupy southern Lebanon. Perhaps the Russian government’s inability to decipher the situation is the reason that Russia, always hoping to involve Washington in a peace settlement, never decisively brought the war in Syria to an end. Now Russia is faced with US, French, and British forces in the American-occupied part of Syria and with Israeli military attacks on Syrian army positions. If Kudrin is permitted to put Russia under Washington’s control, China, whose government also seems impervious to the real situation that it confronts, will stand alone. By privatizing state assets and creating billionaire oligarchs more loyal to money than to China, the Chinese government has created levers for Washington to use to neutralize China. Even if Helmer’s report is true, Washington and its ally Kudrin might still fail for any number of reasons, including the mounting problems of the US. Nevertheless, that Putin is reportedly considering endorsing Kudrin and his surrender policy is an indication that Russians face a challenge to their sovereignty from the pro-American forces in Russia.